Isn’t the tooth fairy business complicated enough? Secondly, on the heels of this “dramatic financial loss” for tooth-losing children everywhere, I caught wind of a story that circulated over a year ago about a nine-year-old who conducted a “controlled experiment” to prove that the tooth fairy wasn’t real and that his parents were in on the hoax! I feel for that kid’s parents – and frankly, parents everywhere on this topic! Who out there hasn’t woken up in a cold sweat realizing that YOU FORGOT to don your Tooth Fairy wings and stealthily slide the “goods” under their pillow? Being a parent carries a lot of pressure, right???? The trending interest in tooth fairy payouts does give me an opportunity to share a few thoughts on the topic of the tooth fairy, fair wages, and how not to raise an entitled child. You might be surprised at how often the question of tooth fairy protocol comes up in the Positive Parenting Solutions community. Let me say that leaving money under pillows from the Tooth Fairy is a time-honored tradition in millions of homes. After all, this cool fairy has credentials and her own Wikipedia page. She was even referenced in the Chicago Tribune as early as 1908! There’s nothing wrong with carrying on tradition. The key is not letting it turn into a gateway drug to a full case of entitlement. After all, if your kids can badger and negotiate their way into a higher Tooth Fairy payout, will they also be able to be negotiate a later bedtime? Or your blessing to wear makeup in elementary school? Perhaps the newest and coolest tech device – because after all, everyone else has one? To avoid sliding down this slippery slope to a full-blown case of entitlement, my advice to parents is to remember your long term objective – to raise responsible, respectful, grateful people. In keeping with the long game, I recommend choosing a lost-tooth payout early in your parenting career and sticking with it. It doesn’t have to increase with the rate of inflation or be linked to national interest rates. It can (and should) be your decision. 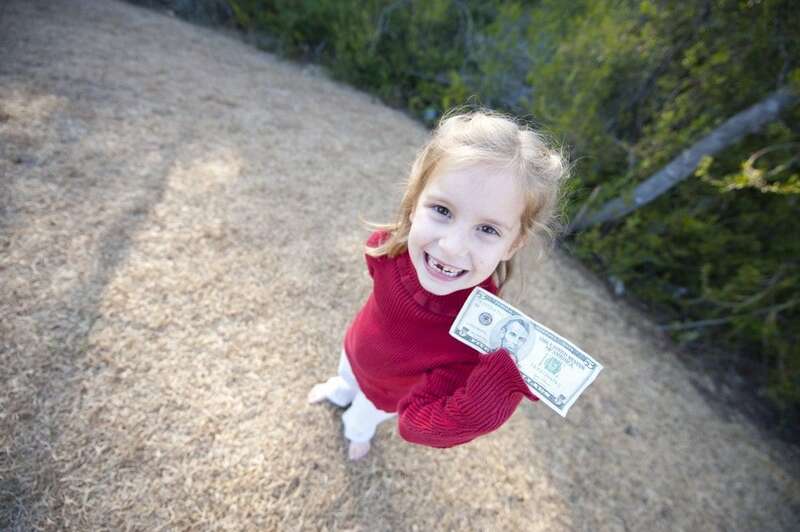 Do you plan to save your tooth fairy money or spend it on something fun? Don’t try to keep up with the Joneses – or any other family. Here’s why: When you start competing with other parents and giving in to demands to meet or exceed what others are doing – or more importantly, what your child feels entitled to, you’ll find yourself on a slippery slope of giving in to go along. And that – is quite the opposite of Positive Parenting. Traditions are wonderful. I’m taken back to when my now grown up boys were little and wiggling their own teeth in anticipation of the Tooth Fairy. It feels like just yesterday and a million years ago all at once. Don’t let the Tooth Fairy or the S&P or national indexes or survey polls spoil any of that for you. Decide what YOU will do and enjoy the sweet memories and the magic. Soon enough, there will be enough complicated “reality” in their lives and in yours. And if you need help navigating the sometimes tricky, other times awesome, and occasionally exasperating journey of parenting children in a time where entitlement seems to be almost a birthright – we’ve got you covered. Join us for our next class to learn more! Best of luck to your precious family from all of us at Positive Parenting Solutions!